I got to see "At World's End" about mid-June and it was probably the best of the Pirates of the Caribbean series. It featured many shots of pirate ship details. The Black Pearl once again puts to sea as Capt. Jack Sparrow leads his Pirates of The Caribbean to bring the ship from its resting place "At World's End". And if you want to build a model of this cursed ship, you may just have to go about that far to find a kit. But finding a kit of an authentic pirate ship you can build and be proud to exhibit will most likely mean kitbashing and existing model. The closest professional model that resembles the Black Pearl is available in relative short supply from Handcrafted Model Ships. There are a maximum of 250 available. 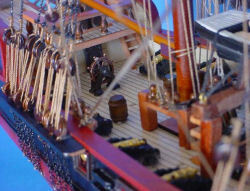 The amazingly detailed 27" long model has a planked deck with nail holes, barrels, buckets, cannon ball racks, rudder chains, coiled ropes, and more. The builder of this model said, "You could order a model from many sites on the internet or even Disney,....But they won't funtion in the water as a proper RC vessel. For that You will need to build a special hull that can hold﻿ all the electronics, and It must be able to actually have running rigging for sailing in the wind. people tend to forget that this type of vessel should not be powered by a propeller". "The sails servo has a long shaft... look for it seen on the deck. It pulls 2 lines that run to the main mast cross tree. a number of rigged lines are also attached to the same area so that all the sails will turn at the same﻿ time," he added. 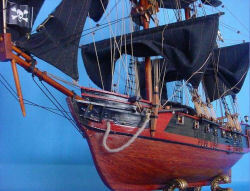 The Black Pearl was a standout in filmed multi-masted ships as she was equipped with black sails. Even the RC model on the film above. This turns out to be an advantage in more than one way. Not only do the black sails act as a sort of intimidation tactic, but the Pearl's crew can put out the deck lamps for added stealth at night. If you get the chance, you will enjoy the appearances of the Black Pearl in the latest Pirates of the Caribbean, but if you want to build your own, take good notes.